Whisk all the ingredients together in a bowl. Fry in a hot pan with a tiny smidgen of butter. They should develop little holes if the temperature is right and look like a flat crumpet. When the top has stopped looking wet and shiney then turn and cook on the other side. This recipe keeps well in the fridge for up to 3 days in an airtight container. 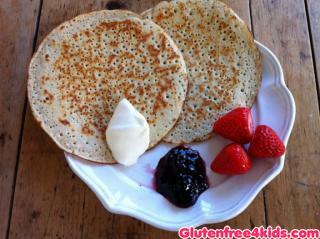 Pancakes can be eaten cold and added to children's snack boxes.